It’s an obligatory thing after a significant player signs a big extension: we wonder when is this gonna happen for the Cubs. We have discussed the topic many times (most recently here), but it’s always nice to hear from players when a deal like Mike Trout’s goes down. 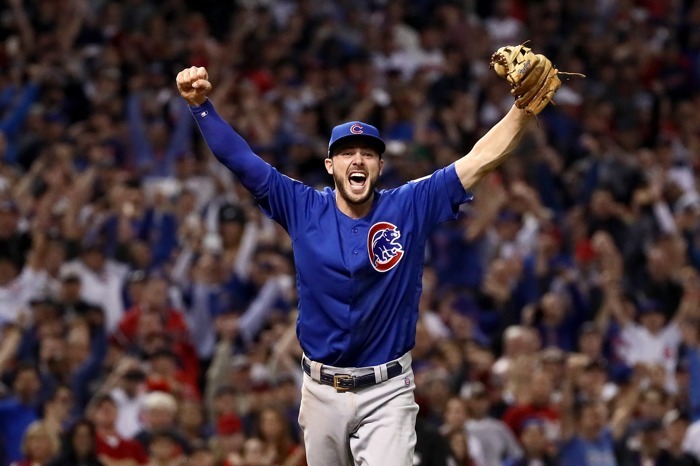 Specifically, it’s nice to hear from the Cubs’ own 27-year-old superstar on the subject of extensions, reiterating that, yes, he’s open to it with the Cubs. OK. It’s done. Full team signs on for life. Let’s go. It’s happening. OK, well, maybe not every single Cub, but MOST of them. Anthony Rizzo also recently made comments about being a Cub for life. I still sense it’s going to be difficult for these two sides to get together on an extension, especially right now coming off a down/injured year for Bryant. That necessarily adds a layer of risk from the Cubs’ perspective, and a layer of I-can-still-rake-so-I’m-not-taking-less upside from Bryant’s perspective. There is also the reality that Bryant is already under control for his age 27, 28, and 29 seasons. Any extension is therefore necessarily going to be buying out seasons in Bryant’s 30s. Can he still be awesome well into his 30s? Of course! But we all know the aging curves, and that is going to be a factor when compared against Arenado, who was going to reach free agency after his age 28 season. It’s good to know that Bryant is open to extension talks, and maybe the sides will engage at some point again. I tend to think it’s far more likely that the Cubs will extend other players before Bryant – not because they don’t love Bryant or believe he is the most impactful player on the roster, but instead because of certain pragmatic and logistical realities. I think all of us would love to see Kris Bryant play his entire career with the Cubs, but it may require him playing through arbitration for a couple more years, and then seeing where things stand – like Arenado – when he’s a year away from free agency. There will also be more information on the state of the game, financially, at that point. And there may also be another star third baseman – and Scott Boras client – getting a deal to use as a comparison in Anthony Rendon, who is otherwise a free agent after this season. The good news is that Bryant is under team control for three more seasons, so there is still plenty of time to get together on something long-term before Bryant hits free agency. I suspect the sides will see what’s up after this season. Bryant has been approached this spring by reporters after Arenado's extension, after Harper signed and now in wake of Trout deal. KB: "I'm just getting tired talking about this stuff. It's really boring. I just want to play baseball. I just said boring again. That's not cool."